The CERN Axion Solar Telescope (CAST) is looking for axions and axion-like particles since 2003. The axions are hypothetical particles arising in models which may explain the CP problem of strong interactions and can be Dark Matter candidates. With the help of a decommissioned LHC dipole magnet hopes to convert axions produced by the Primakoff process in the solar core into detectable x-ray photons. These photons would carry the energy and the momentum of the original axion. CAST is the most sensitive axion helioscope built so far. Its sensitivity is based on three points, a powerful magnet, an x-ray focusing device and low-background detectors. 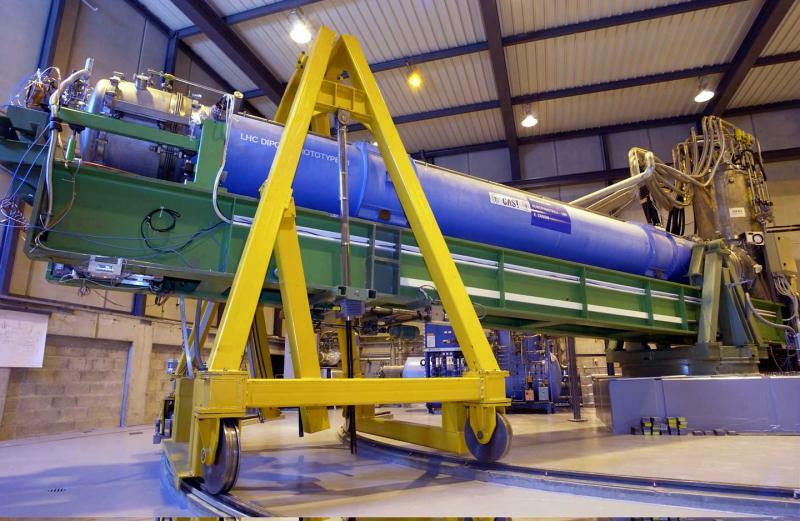 The magnet employed in CAST is an LHC dipole prototype, which can reach 9T along the 9m of its length. With the help of a moving platform, it is aligned with the center of the sun for 90 min twice a day. A total of four detectors are connected at the two ends of the magnet, two looking at sunrise and two at sunset. The CERN Axion Solar Telescope (CAST) aims to shed light on a 30 year old riddle of particle physics by detecting axions originating from the 15 million degree plasma in the Sun’s core. Axions were proposed as an extension to the Standard Model of particle physics to explain one of the left intriguing problems in quantum chromodynamics (QCD), the so-called strong CP problem: the theory predicts the existence of a CP violating term in the standard equations, yet Nature has never exibited this in any experiment. The most striking proof of this is the neutron electric dipole moment which is expected to be ~10 orders of magnitude larger than its measured upper limit. The most elegant way to solve this problem is to introduce an additional global symmetry (Peccei & Quinn). As a result, the CP violating term is eliminated and the strong CP problem solved. In the real world we do not observe the Peccei-Quinn symmetry which implies that it is spontaneously broken at some energy scale. The associated Nambu-Goldstone boson is called axion. Several axion models exist but they all have something in common: axion is a neutral, very light particle that interacts very weakly with ordinary matter. Owing to their potential abundance in the early Universe, axions are also leading candidates for the invisible dark matter of the Universe. Cosmological and astrophysical considerations have already given some constraints on the axion properties (mass and couplings to fermions, nucleons and photons). According to these bounds, axions are allowed to live only in a small window in the mass range of meV to some tens of meV. It has to be taken into account that these constraints are rather uncertain, and have not stopped researches from looking for axions exploring even “forbidden” regions. Searches for solar axions began 20 years ago when the US Brookhaven Laboratory first pointed an axion telescope at the Sun – a highly useful source of weakly interacting particles for fundamental research, as the solar neutrino anomaly amply demonstrates. Axions would be produced in the Sun through the scattering of photons from electric charges – the Primakoff effect – and their numbers could equal those of solar neutrinos. The idea behind the Brookhaven experiment, first proposed by Pierre Sikivie, was to put the Primakoff effect to work in reverse, using a magnetic field to catalyse the conversion of solar axions back into X-rays photons of a few keVs. The Brookhaven telescope was later joined by another in Tokyo, while other experiments continued to search in different ways. Experiments at Lawrence Livermore Laboratory and Kyoto, for example, search for relic axions from the early Universe. CERN’s NOMAD experiment joined the hunt, looking for axion production in a neutrino beam (credit vida). 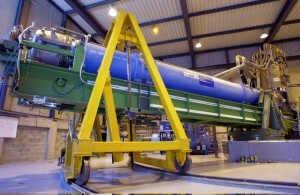 Searches based on axion Bragg scattering have been performed by the SOLAX and COSME collaborations using single crystals of germanium in underground laboratories, while optical detection techniques are used by Italy’s INFN laboratory experiment, PVLAS. This list is not complete, but, taken together, earlier experiments have scanned the kinetic energy range from 10-11 eV up to 1011 eV, so far without success. CAST, however, could make a difference because of the length and strength of the magnetic field that it has available by using a prototype magnet for CERN’s LHC collider (figure 1), enhanced by the use of a focusing X-ray telescope. The conversion efficiency for axions increases as the square of the product of the transverse magnetic field component and its length. This makes a 9 tesla, 10 m LHC prototype dipole magnet with two straight beam pipes ideal for the task, giving a conversion efficiency exceeding that of the two earlier telescopes by a factor of almost 100. CAST’s LHC magnet is mounted on a platform with ± 8° vertical movement, allowing for observation of the Sun for 1.5 h at both sunrise and sunset. The horizontal range of ± 40° encompasses nearly the full azimuthal movement of the Sun during the year. The time the Sun is not reachable is devoted to background measurements. In order to detect photons coming from the magnet bores, as a result of axion conversion in the magnetic field, several low-background X-ray detectors are installed on both ends of the magnet. Until 2007, a conventional Time Projection Chamber (TPC) was located at one end, covering both magnet bores, to detect photons originating from axions during the tracking of the Sun at sunset. It was then replaced by two MICROMEGAS detectors, each attached to one bore. On the other side of the magnet, there is another MICROMEGAS detector covering one bore, and an X-ray mirror telescope with a pn-CCD chip as the focal plane detector at the other bore, both intended to detect photons produced from axions during the sunrise solar tracking. Phase I : during 2003 and 2004 the experiment operated with vacuum inside the magnet bores, thus exploring the axion mass range up to 0.02 eV [1, 2]. With the absence of signal over background, an upper limit on the axion-photon coupling constant of gag < 8.8 × 10-11 GeV-1 at 95% C.L. was set. This result superseeds the astrophysical limit derived from energy-loss arguments on horizontal branch stars (figure 2). Phase II with 4He: for CAST, above 0.02 eV mass, the sensitivity is degraded due to coherence loss. The experimental setup was upgraded in 2005 in order to extend the sensitivity to higher axion masses. For this purpose, the experiment has to operate with the magnet bores filled with 4He whose density has to be increased in appropriate steps to cover equally a range of higher axion masses. During 2005 and 2006, the experiment scanned the range of axion masses from 0.02 eV/c2 to 0.39 eV/c2 and set the most restrictive limit on the axion-photon coupling constant for this range of masses . The resulting upper limit on the axion-photon coupling constant is shown in figure 2. The measurement time at each pressure setting was only a few hours, resulting in large statistical fluctuations of the exclusion limit. For the first time, the limit entered the QCD axion model band in the electronvolt range. Due to the condensation of 4He at high pressures (aprox. 14 mbar at 1.8 K, the operating temperature of the CAST magnet), the system had to be thoroughly upgraded to use 3He as a buffer gas. Phase II with 3He: From 2008 to 2011, CAST was taking data with 3He inside the magnet bores and scanned the range of axion masses up to 1.18 eV. The first results for the axion mass range 0.39 eV < ma < 0.64 eV are shown in figure 2. CAST is the first axion helioscope experiment that crossed the KSVZ axion line. In 2012, CAST has been using 4He in order to revisit, with improved sensitivity and longer exposures, a narrow part of a theoretically motivated range of axion masses around 0.4 eV. In parallel, CAST has been looking for axions that could be produced by different mechanisms: solar axion emission from 7Li and D(p,γ)3He nuclear decays , 14.4 keV solar axions emitted in the M1-transition of 57Fe nuclei , and low energy solar axions . K. Zioutas et al. [CAST Collaboration], “First Results from the CERN Axion Solar Telescope”, Phys. Rev. Lett. 94 121301 (2005). S. Adriamonje et al. [CAST Collaboration], “An improved limit on the axion-photon coupling from the CAST experiment”, J. Cosmol. Astropart. Phys. JCAP04(2007)010. E. Arik et al. [CAST Collaboration], “Probing eV-scale axions with CAST”, J. Cosmol. Astropart. Phys. JCAP 02(2009)008. S. Adriamonje et al. [CAST Collaboration], “Search for solar axion emission from 7Li and D(p,γ)3He nuclear decays with the CAST X-ray calorimeter”, J. Cosmol. Astropart. Phys. JCAP03(2010)032. S. Adriamonje et al. [CAST Collaboration], “Search for 14.4 keV solar axions emitted in the M1-transition of 57Fe nuclei with CAST”, J. Cosmol. Astropart. Phys. JCAP12(2009)002. G. Cantatore for the CAST collaboration, “Search for low Energy solar Axions with CAST”, [arXiv:0809.4581 [hep-ex]].